The big breakthrough in McIlroy’s career came in 2011 when he landed the US Open at Bethesda, Maryland, crushing the field by securing an 8 stroke victory over Australia’s Jason Day. It had been a tremendous response from McIlroy after a crushing blow at the 2011 US Masters. McIlroy had the title in his grasp only to throw it away. Leading by four strokes at the start of play on the final day, everyone was expecting McIlroy to claim his first Major title then. But a shocking round of 80 left him reeling down in T15 at the finish. However, the record was finally set straight for him at the US Open, setting a new aggregate score record at the event, on his way to a storming victory. 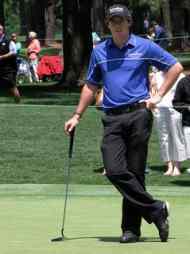 McIlroy won the second Major title of his career when he took the PGA Championship title in 2012, helping him to finish the year top of the US PGA Money List. During a remarkable 2012, where he committed his time mostly to the US PGA Tour, McIlroy became the first ever European to pick up four PGA titles in a season. Prior to that, only Tiger Woods had managed to win five events in a single season. McIlroy was also successful in the 2012 Race to Dubai, the European money list. Wins at the BMW Masters and the Barclays Singapore Open, in some stunning end of season form, saw him round off things by winning the season finale at the DP World Tour Championship in Dubai as well. Claiming both the US and European money list titles in the same year, he emulated what Luke Donald had achieved for the first time in golf history, the previous year. McIlroy was awarded the PGA Player of the Year, the PGA Tour Player of the Year and the European Tour Golfer of the Year in 2012. The Northern Irish star collected an MBE from the Queen in the 2012 New Year Honours List from the Queen.